Every school child has heard the story of Sir Francis Drake and his game of bowls on Plymouth Hoe as the Spanish Armada was sighted in the English Channel. He is said to have insisted on finishing his game (which incidentally, he lost!) before taking on and defeating the mighty Spanish fleet in 1588. The name ‘Hoe’ derives from Old English and appropriately enough, means ‘high ground’. Today Plymouth Hoe is an open green space overlooking the Sound and is used to host major events. The park as we see it today was largely developed in the 1870s for the Victorians to enjoy, but it has long been a place of entertainment. Bull baiting took place here until 1815 and, of course, bowls have been played here for centuries. The Hoe enjoys a strategic position overlooking Plymouth Sound. In Tudor times a fortress was built here to defend the coastline from attack. This was replaced by the Royal Citadel in the late 17th century. Still occupied by the military today, The Citadel has been in constant use since it was built in 1665. On arrival at the Hoe, the visitor’s attention is immediately taken by the iconic Smeaton’s Tower lighthouse, originally built on the Eddystone reef in 1759. When the reef on which it was built began to break up in the early 1880s, it was decided to take it down and remove it, stone by stone, to its current position. Keen-eyed visitors will be able to spot the current Eddystone lighthouse and the base of this one, still in position on the reef, on the horizon. The tower’s trials and tribulations did not end there though: in 1913 suffragettes campaigning for ‘Votes for Women’ targeted the lighthouse, placing a small homemade bomb in the doorway. Fortunately, the wind blew out the fuse! Smeaton’s Tower stands 72 feet high and visitors can enjoy fantastic views of Plymouth Sound from its lantern room – if they are willing to climb the 93 steps up to it! A small fee applies. There are several statues and memorials on the Hoe. There is a statue of Drake here, a copy of the one in his home town of Tavistock. There is also a separate Armada monument, built in 1888 to celebrate 300 years since the defeat of the Armada and featuring a statue of Britannia. Close to the Armada monument stands the Royal Air Force and Allied Air Forces monument, dedicated to all the men and women who served, both in the air and on the ground, during World War Two. Erected in 1989, it is dominated by a six foot tall, bronze statue of the Unknown Airman. The Plymouth Naval Memorial, unveiled in 1924, commemorates 7,251 sailors of the First World War and 15,933 of the Second World War. After exploring the Hoe, it is an enjoyable stroll along the sea front down to Sutton Pool, the historic harbour area of Plymouth. Pause at the Mayflower Steps, from where the Pilgrim Fathers departed for the New World in 1620, before visiting the Mayflower Museum just across the road to discover their story in greater detail. – As well as the Pilgrim Fathers, another notable expedition, led by Sir Humphrey Gilbert the ‘father of British colonisation’, set sail for Newfoundland from here. Gilbert claimed Newfoundland for Queen Elizabeth I in 1583. – In 1584 Sir Walter Raleigh commissioned Arthur Barlow and Philip Amadas to sail to the New World to explore and prepare for colonisation. In 1585 a colony was established on Raonoke Island in modern day South Carolina but this failed after a year. A second colony was then established in 1587 however this colony disappeared sometime between 1587 and 1590. It became known as ‘Raleigh’s Lost Colony’. 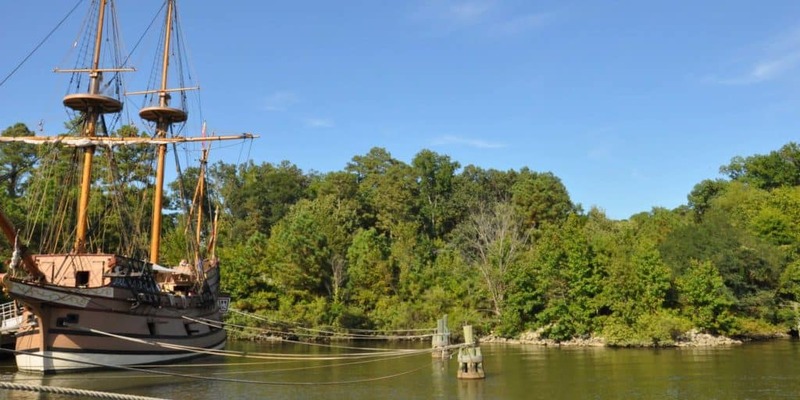 – In 1609 the Sea Venture left from Plymouth carrying settlers and supplies to the infant colony of Jamestown, Virginia. Shipwrecked on a reef off the then uninhabited island of Bermuda, it took just ten months for the settlers to construct two ships and continue their voyage. – In 1839 the Tory left Plymouth carrying representatives of the New Zealand Company whose mission was to explore and prepare settlements. The Tory reached Port Nicholson in September after just 96 days, and in so doing began the colonisation of New Zealand. After strolling the quayside, wander a little further into the old town where you will find plenty of cafes, ancient inns, restaurants, gift and antique shops as well as the world famous Plymouth Gin Distillery, housed in a 14th century medieval building and the oldest working gin distillery in England. Parking for the Hoe is available on the roads nearby (fees apply) or in nearby Elphinstone car park on Madeira Road.